The winter is my least favorite time of year. It is harder to drive in the snow, and the drop in temperature spikes the amount of doctor visits. The most common illnesses during the winter include the common cold, the flu, and ear infections. A middle ear infection, also known as otitis media, is a serious problem for young children and grandchildren. Ear infections are considered the number one health issue for children, and they affect two-thirds of children in the U.S. Adults are also at risk—especially seniors who may experience hearing loss from an infection as well. What are signs of an ear infection? You may experience pain inside your ear, fluid drainage, a collapsed or bulging eardrum, tinnitus (ringing in the ear), vomiting, nausea, and vertigo. Ear infections will also often follow an allergy or a common cold. Antibiotics are often overprescribed for ear infections, because 80% of the bacteria present within the infection are considered resistant to the antibiotic. Ear infections incidences are actually known to double from antibiotic use. Antihistamines and pain relievers are also used to treat ear infections. However, surgery is often required when people do not respond to the drugs. Instead of treating the infection, it is best to look at one of the main causes—food allergies. Studies have shown that food and environmental allergies are common in 70% of children with ear infections. It is best to eliminate common food allergies from your diet, such as wheat, gluten, dairy products, peanuts, egg, citrus, corn, and chocolate. You might also consider a test for food, chemical, and environment sensitivities with a method called bio-energetic feedback. Finding out your allergies may help get to the root of the ear infection problem. It is also best to avoid tobacco smoke and alcohol, which deplete the immune system. Essential oils are also known to help people with ear infections. The Eustachian tube protects the middle ear from bacteria, clears fluids, and regulates gas pressure from the middle ear. Two to three drops of eucalyptus behind the ear, on the chest, and down the throat can open the Eustachian tube. Rosemary oil is also known to be helpful for viral and bacterial infections. Lavender is often used to help reduce congestion and promote fluid drainage. It is best to apply lavender down the neck and outside the ears. Chamomile, tea tree oil, peppermint, and pine are other essential oils that can help soothe any ear pain and infections. Another method of opening up and draining the Eustachian tube is a chiropractic treatment. Chiropractic adjustments relieve ear infection pain and congestion. Chiropractors will often drain the ear fluid into the back of the throat. I recall a 1996 study that analyzed data from a Minneapolis private chiropractic practice. Chiropractic care improved 93% of ear infections in 46 children that were five years old and under. The patients were treated three times during the first week, twice for the next week, and once for the final week. Treatments were stopped after patients showed improvement, and 75% improved after 10 days or less. One or two treatments were needed for 43% of the patients. The chiropractor would adjust the occiput and the cervical vertebrae. Other techniques used during the procedure were modified applied kinesiology and a sacral occipital technique-style pelvic blocking. 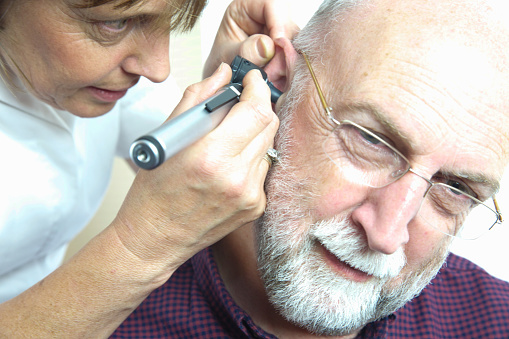 Chiropractic care for ear infections is also considered highly effective for adults and seniors. Ear infections and other infections often surface from a depleted immune system. Probiotics can help you recover from an ear infection by supporting the digestive tract with good bacteria. Probiotics can also reduce inflammation from food sensitivities, which also helps improve overall digestion. Probiotic foods such kombucha, kefir, miso, and kimchi can help boost the immune system. Zinc, vitamin E and vitamin C are also important nutrients that can be supplemented to treat colds and ear infections. Other possible natural remedies for ear infections include fermented cod liver oil, colloidal silver, elderberry syrup, and fresh onions. Marigold, St. John’s wort, mullein, and garlic are common herbs used for ear infections. Homeopathy is also considered effective for the elimination of food allergens such as eggs, wheat, and dairy. Some remedies to consider include pulsatilla, silicea, mercurius, chamomilla, belladonna, and calcarea carbonica. Murray, M., M.D., et al, The Encyclopedia of Natural Medicine (New York: Atria Paperback, 2012), 557-564. Hershoff, A., N.D., Homeopathic Remedies: A Quick and Easy Guide to Common Disorders and Their Homeopathic Treatments (New York: Penguin Putnam Inc., 1999), 150-151. Matthew, A., “What Essential Oils Are Good for Sinuses and Ear Aches?” Livestrong.com, January 28, 2014; http://www.livestrong.com/article/106638-essential-oils-good-sinuses-ear/. Froshle, R.M., “Ear infection: a retrospective study examining improvement from chiropractic care and analyzing for influencing factors,” Journal of Manipulative Physiological Therapeutics, 1996; 19(3): 169-177. “Natural Remedies For Ear Infections,” Mommy Potamus web site; http://www.mommypotamus.com/natural-remedies-for-ear-infections/, last accessed October 9, 2015.